We offer the most comprehensive and complete finance and insurance software module. 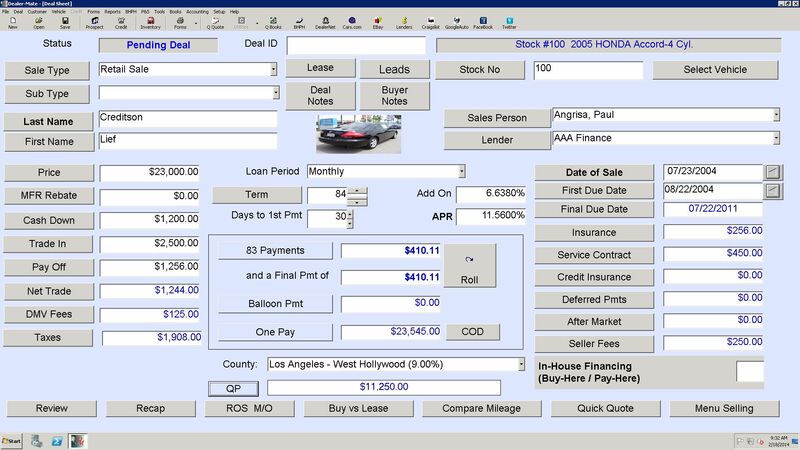 Dealer-Mate’s F&I include all of the functions and is comparable to ADP and Reynolds & Reynolds which are the most expensive DMS systems on the market today, yet offering the most powerful tools to maximize your profit with a simple interface for a fraction of the cost. View and enter all your data from one screen that allows you to run complex calculations in a minimum number of clicks. New Deal screens start with several fields pre-populated automatically from default values you specify in setup section, including credit life and a&h, Warranty, Sales Tax Rates for every city, county, and state, License, Doc Prep and many other items specific and unique to your state. The Rollback feature for outside and in-house financing shows how you can revise any combination of financing values to hit your target, including Cash Price, Interest Rate, Down Payment, Finance Charge, and Out-The-Door price. For BHPH dealers, we offer multiple deferred payments with almost no limit, which will automatically calculate late charges and print a late notice for customers. 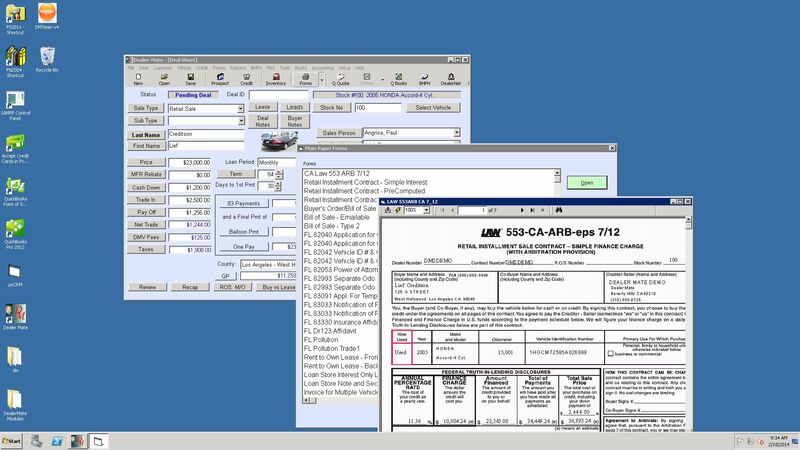 Up to 3 trade-ins may be added to the inventory as soon as deals are sold, reducing duplicate data entry.